¶ 4 Leave a comment on paragraph 4 0 Memorials and monuments reflect more about the time when they are built than about the past events and people represented. Celebrations and pageants, such as the national Pilgrim Tercentenary, used commemorative moments to define Americanness in post-War America in the eyes of the event’s organizers. Regional preservation groups, such as the Association for the Preservation of Virginia Antiquities (APVA), erected memorials and preserved sites during this time tied to Virginia’s founding families that recast British settlements at Jamestown and Williamsburg as harmonious and homogeneous. For elite Virginian members of the APVA, post-Civil War political and cultural upheaval left them with a present they did not like. Preservation and reconstruction efforts let them-–and other groups working in different states—return temporarily to time when white elites commanded power and deference from blacks and poor whites. 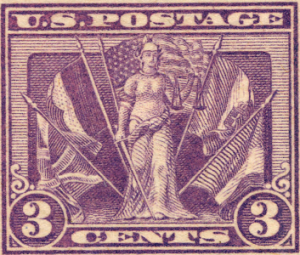 ¶ 7 Leave a comment on paragraph 7 0 This chapter will reveal how different groups reached backwards to use images and individuals from the past to address cultural and political unease with 1920s and 1930s America through the medium of commemorative stamps.